You want to synchronize your Pocket-PC or Mobile Phone with other Microsoft? Outlook? folders than default-folders? So you can have a look at OLMixedFolders. Here you copy all items from public-folders or subfolders to your default-folder which is synchronized with your Pocket-PC via your synchronization-software like ActiveSync. ...... You can include multiple folders to OLMixedFolders. 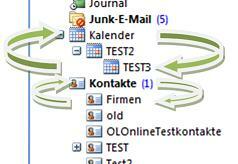 Easy configuration, all you have to do is right click on your subfolder or public-folder and choose OLMixedFolders tab. Set the category for the folder and that's it. If you do any changes on your mobile device you get the changes after the synchronization back to your sub-, or public-folder. You can exclude private items from synchronisation also it is possible to define some categories as filter for the synchronisation. Qweas is providing links to OLMixedFolders 1.20 as a courtesy, and makes no representations regarding OLMixedFolders or any other applications or any information related thereto. Any questions, complaints or claims regarding this application OLMixedFolders 1.20 must be directed to the appropriate software vendor. You may click the publisher link of OLMixedFolders on the top of this page to get more details about the vendor.